We have been hosting three of our grandsons for the past few days. Staying with the grandparents is certainly different than when I grew up. First, I grew up in southern New Mexico and Texas, so March was definitely a spring month instead of being late winter. While its good for children to be outside, windy days in the low 40's aren't conducive to playing out for long! Thank gosh for trusty iPads! 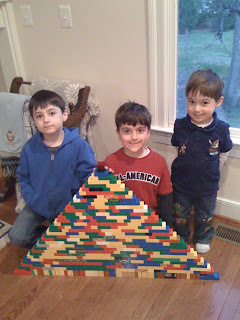 The boys are 8, 6 and 3, so their interests and ability levels vary widely. While they play on the Wii quite nicely, the 3 and 6 year olds seldom get to "win." We have two iPads and they brought theirs from home, so each can play independently or they can play games that allow sharing over our home network. We can also intersperse reading and educational activities with game play. 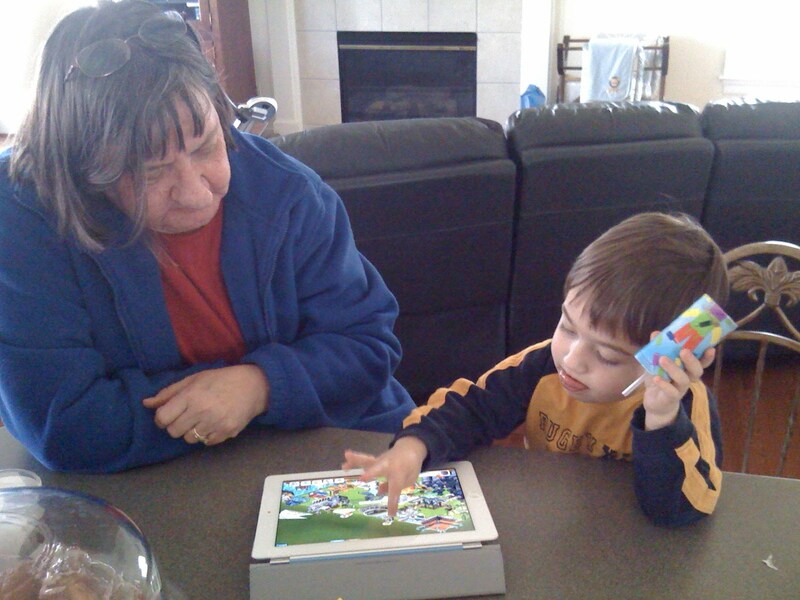 Video monitors are certainly convenient, but interaction with people is also desirable, so we try to balance out their electronic play, but as baby-sitters the iPad certainly has some advantages. However, too much "screen time" often means not enough "wiggle time," so we have lots of other things to do. In this case, it is our play table. Originally intended for wooden trains, the drawers are often full of different toys. At the moment they are filled with our large collection of Lego Duplo building blocks. The collection began when our youngest children were preschoolers. As our older grandchildren outgrew their Duplo, I traded used Lego purchased from eBay for their stash. Even though the oldest grandchildren in this picture have graduated to real Lego, it is not allowed on the main level of our home (It is stored in the upstairs playroom, far away from visiting babies and crawlers. ), they still have lots of fun with the Duplo.